Trident Trains stocks an extensive range of 'OO' guage locomotives and rolling stock from Hornby, Bachmann and Dapol. All our locomotives are displayed for you to see them in all their glory before making a purchase and we are happy to give demonstrations of running performance on our purpose-built test track. At any one time there are at least 130 models on display. We have everything from beginner starter sets and the Hornby Railroad Range aimed at younger modellers, right through to the highly detailed models for the more serious collector. We are an official Hornby Collector's Centre which means we also receive special limited edition models that aren't available from all model shops. We are also a Dapol Gold Stockist which means we are guarenteed to have the latest Dapol models as soon as they are available on the market. 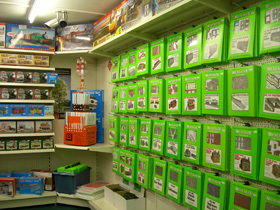 At Trident Trains we don't only cater for the OO gauge modeller - we also stock a large number of N gauge models from Graham Farish and Dapol. Locomotives and rolling stock are available and are on display for you to see every tiny detail. As well as an extensive range of models to run on the tracks, we also specialise in a full range of scenic items and materials to help you turn your train set into a model railway. From pre-constructed buildings from Hornby and Bachmann through to scale vehicles, kits and scatters - we'll have the things you need to bring your railway to life! As well as plastic and resin scenic buildings, we also stock a large range of Metcalfe cardboard model kits. For those who need lots of buildings but don't want to pay the price of resin models or those that enjoy the satisfaction of building the models from scratch, these kits are the perfect solution. It's also important to have the right tools for the job to make sure you always get the best results. 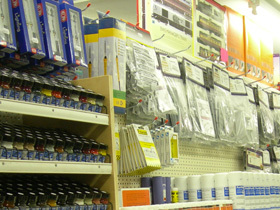 That's why we sell all the tools, paints and accessories you'll need to add those extra levels of detail to your model railway and keep your trains and track in perfect condition. 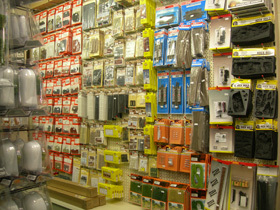 We also stock many electrical accessories, for example to motorise points and add signal lights, to help add an extra level of realism to your railway. 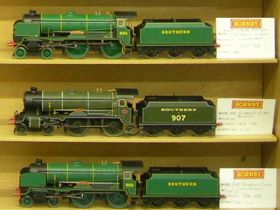 Trident Trains also sells many second-hand locomtives, wagons and coaches on behalf of other customers. All these models are thoroughly tested and in full working order. This can be an ideal way to expand your model collection at a lower cost or to get hold of some hard-to-find and discontinued models. We will happily show you the locomtives in action on our test track to make sure you are happy with the condition of the model before you buy.